Get tickets to this year's event here! It's nearly upon us, burger lovers: Time Out New York’s live Battle of the Burger smackdown, presented by Budweiser, returns this Thursday, August 18 at the South Street Seaport. And with it comes 20 stellar burgers made by 20 local restaurants, ready to be enjoyed by some of the city's most discerning diners: you! If you don't have tickets yet for the 5pm session (the 8pm is sold out! ), grab 'em now and prep for the festivities by feasting your eyes on the 20 tasty participants of this year's Battle of the Burger event. 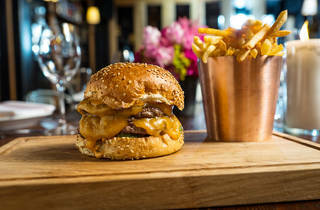 Marc Forgione's steakhouse offers its house burger—tricked out with bourbon-splashed caramelized onions and beer cheese—at both the Tribeca original and the Midtown offshoot. The team behind this Andrew Carmellini-led Soho spot will be on deck at Battle of the Burger with its lunchtime double cheeseburger with secret sauce. The menu at this chain's flagship centers on an intensely juicy burger, a custom mixture from Pat LaFrieda served on a soft, simple bun. Michelin-starred chef Joe Isidori (formerly of Chalk Point Kitchen and Las Vegas's DJT) grills hefty sandwiches at this low-key patty joint. The Williamsburg hang will be serving its house burger, finished with pickled onions, American cheese and special sauce, at Battle of the Burger. Can't make it to this high-ceilinged, light-filled restaurant? They're bringing their excellent burger to the South Street Seaport this year. The burgers on offer at this Gotham West Market joint are the kind of dripping, dutifully sloppy burgers that fuel family road trips along Route 66. This old-school pub burger features freshly ground New York strip that's broiled to a perfect char and simply decorated with lettuce and tomato—cheese and raw onion are optional. This relaxed midtown spot serves elevated American fare, like a truffle burger with baby arugula and crispy leeks. This jazzed-up corner pub turns out casual crowd-pleasers like a dry-aged steak burger with sweet caramelized onions and oozy American cheese. Brothers Martin and Mark Whelan are behind this Irish-proud pub, serving a hot-sauce–dipped “Angry Burger” with Maytag blue cheese and crispy fried onions. The house specialty of offer at this Crown Heights spots is a grilled seven ouncer topped with cheddar, mushrooms and caramelized onions. A frosty mug of beer is an ideal match for Dram’s solid griddle-cooked double cheeseburger. This Upper East Side bar dabbles in both across-the-pond classic (fish ’n’ chips) and stateside favorites, like a cheeseburger hooded with bacon-bourbon jam. The eight-ounce burger here, hooded with aged white cheddar, gets its lick from a slathering of house-made pickled jalapeño mayo. 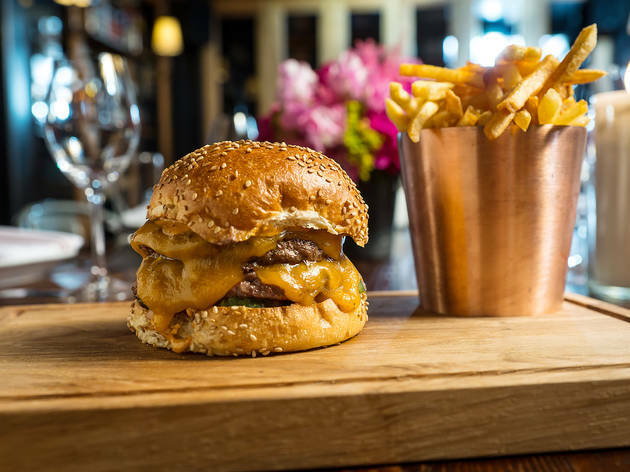 The oldest family-owned bar in New York will be well-represented at Battle of the Burger with its half-pound burger, loaded with aged cheddar, pickles and "fancy sauce" on a brioche bun. The burger at this East Village gastropub boasts some pedigreed meat: Dry-aged and deckle trimming. This hidden spot in the posh Parker Meridien is a perfectly recreated burger emporium (wood paneling, vinyl booths) and so are its juicy burgers, doled out with iconic ingredients like Heinz ketchup and Arnold’s buns. This East Village hole-in-the-wall serves great budget burgers, griddled to order by a grease-splattered cook.